In this document we walk you through all the steps you must take to deploy the sample JSP into JRun 3.1 Application Server. Copy the provided ExcelCalculatorJSP.html, and ExcelCalculatorExample.jsp files into a local directory that will be the target directory of your deployment. These files are included in your jintegra\examples\servlet-com\ServletToExcelCalculator directory when you download J-Integra®. The application server needs to know where it can find the classes referred to by the JSP. 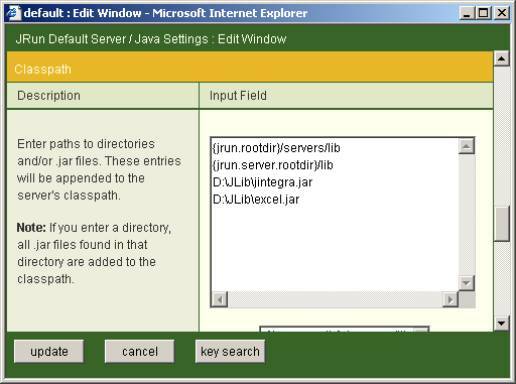 If you want to share these jar files among other servlets and JSPs, JRun allows you to specify the path to the java library files that they use. 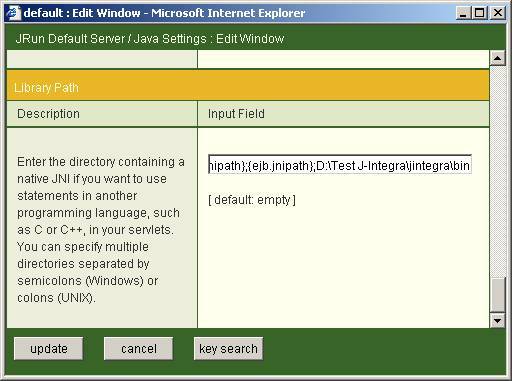 In this section you will learn the steps to setup the path to the library files. 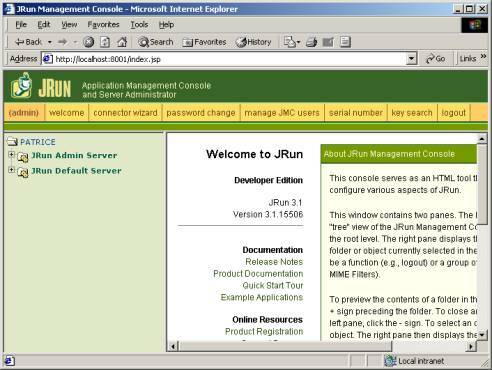 Start the JRun Management Console and enter the password to log in. 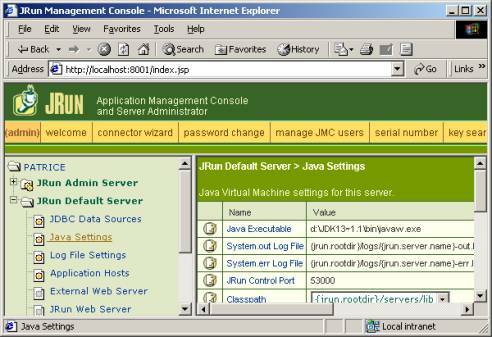 Click JRun Default Server and select Java Settings in the left panel. J-Integra® can take care of the security issue if it can access one of its native libraries. All the native libraries of the J-Integra® are resided in bin directory beneath jintegra directory. JRun allows you to set the path to your native libraries, so you can use them if you wish. 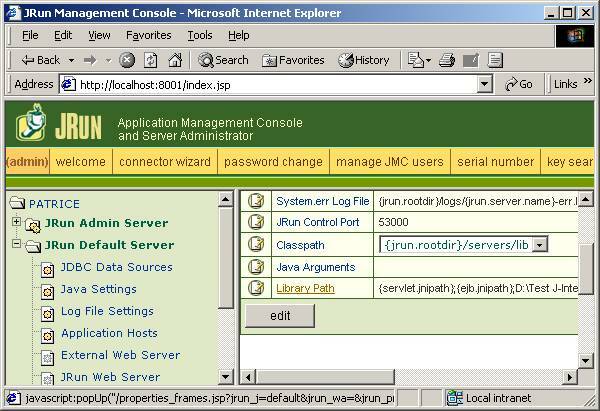 On this section you learn how to setup JRun to access the native libraries. Click update. 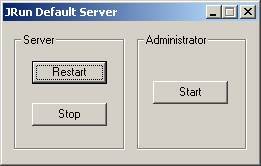 Then, to be safe, restart your JRun Default Server. This section explains how you can run the ExcelCalculatorExample.jsp on the JRun 3.1. The easiest way to deploy a JSP/Servlet in JRun is by having a WAR file that contains all necessary files. We need ExcelCalculatorExample.jsp, ExcelCalculatorJSP.html, and the XML descriptor. Create the XML descriptor: Here is the sample XML descriptor you can use to deploy this sample. Save this file as web.xml in the WEB-INF directory. This file is included in your jintegra\examples\servlet-com\ServletToExcelCalculator directory (named web.xml for JSP) when you download J-Integra®. Create a manifest file: Create a file called Manifest.mf (it can be an empty file). Save this file in the META-INF directory. 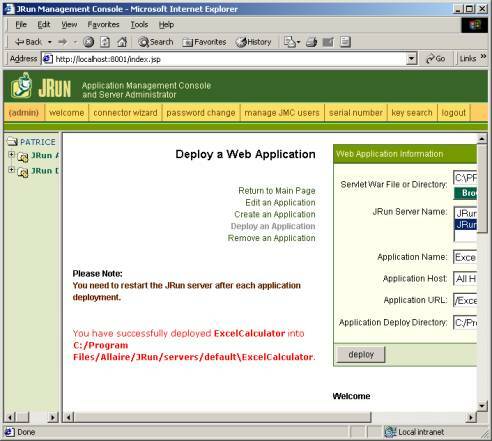 We have the WAR file and we can deploy it into JRun Application Server. 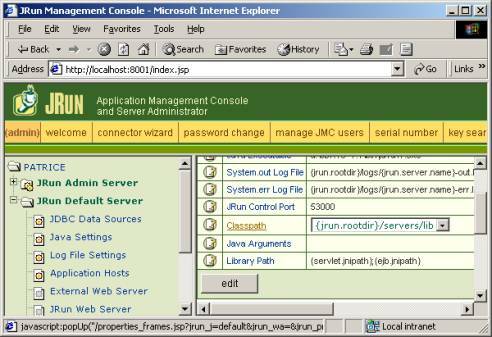 Start the JRun Management Console and enter the password to log in. 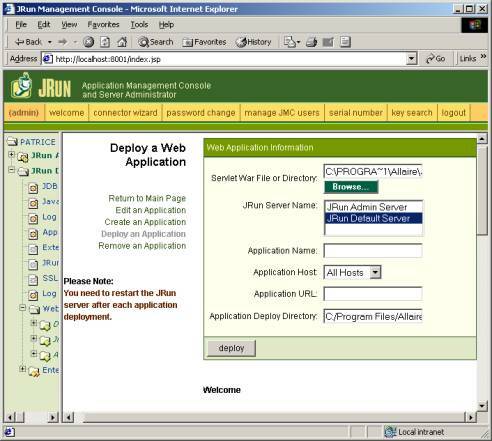 Click JRun Default Server. Then click Web Applications. 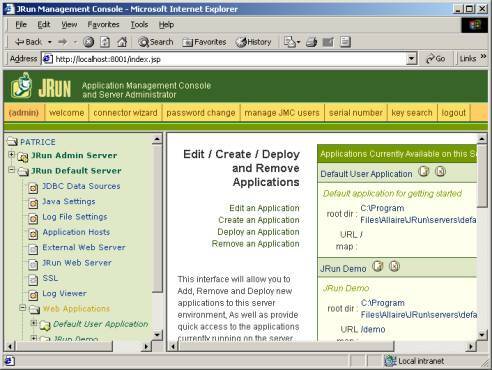 In the right panel, click Deploy an Application. Click the Browse button and select the WAR file you created in step 8. 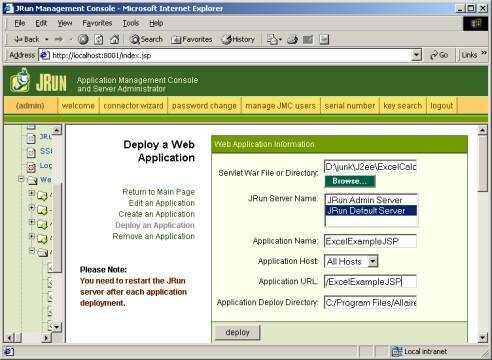 Type in ExcelExampleJSP as the Application Name and /ExcelExampleJSP as the Application URL. Do not forget to put / at the beginning of the Application URL. If the deployment was successful, you need to restart the JRun server in order to use the newly deployed servlet. 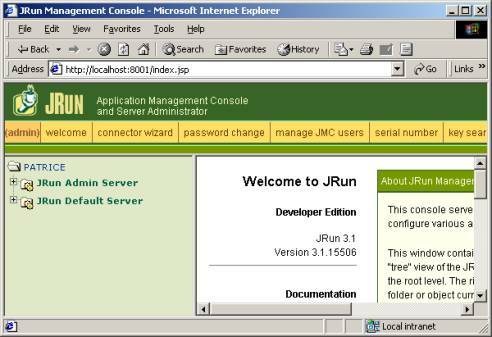 Double-click on the JRun Default Server icon on your system tray and click the Restart button. Open your Web browser and enter http://localhost:8100/ExcelExampleJSP/ExcelCalculatorJSP.html as the URL. Enter two numbers and click Submit. For information on setting up the environment for different platforms, see Setting up the environment to run a JSP and/or Servlet file.